Russia’s Ministry of Defense (MoD) is expected to be the launch customer for the MiG-35 multi-role fighter. Sergei Korotkov, Russian Aircraft Corporation MiG (RAC MiG) general director, said the company and the MoD are negotiating an initial order for 24 aircraft, with an option that would increase the number to about 40. The MiG-35 is an evolution of the MiG-29M/M2, meant to be more combat efficient and versatile. The fighter’s mechanically steered radar is replaced by an active electronically scanned array (AESA) radar. Phazotron-NIIR is offering the Zhuk-MAE radar, a system that was flight-tested during RAC MiG’s unsuccessful bid for the Indian medium multirole combat aircraft (MMRCA) tender. India selected Dassault’s Rafale for the MMRCA requirement in January last year. “We participated in the Indian competition with the MiG-35 but did not make the short-list for political reasons,” Korotkov said. But since the MMRCA contract is not final, “we keep our hopes,” he added. The expected MiG-35 order from Russia’s MoD would follow a contract for 24 MiG-29K/KUB deck fighters for the Russian navy, which was awarded last year. RAC MiG will deliver four aircraft this year and the remainder in equal quantities in 2014 and 2015. “The first airplane is complete and awaits customer acceptance, the second and third are in the final assembly shop and the fourth is being mated,” Korotkov said. He added that MoD orders will enable RAC MiG to maintain a steady level of 10 shipments annually for the foreseeable future. Simultaneously, MiG will continue to manufacture MiG-29K/KUBs for the Indian navy, which has received 20 aircraft and awaits 25 more shipments. 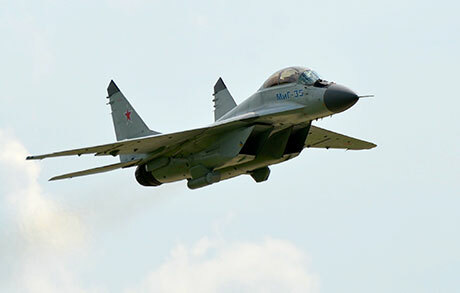 Korotkov said Syria, which placed an order for 24 MiG-29M2s in 2007, is pursuing another “order for more than 10 aircraft.” The order has been held up by Syria’s civil war. “The Syrian delegation is in Moscow now [and] talks are being held regarding the destiny of their order,” he said.